Some people like to say that bullies really just hate themselves. That might be true of many, but not of all; some people are just mean, and enjoying being mean to others to give themselves power, or because they get some perverse pleasure from it. And sadly, there are some people who never seem to escape the taunts of bullies, no matter their age. 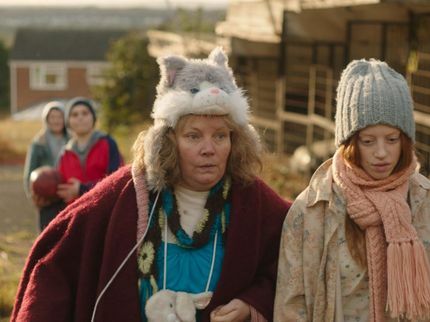 In Pin Cushion, writer/director Deborah Haywood tells a beautiful and thoroughly heartbreaking story of two people who cannot seem to escape these bullies, and the terrible strain it puts on them and their relationship. Iona (Lily Newmark) and her mother Lyn (Joana Scanlan) have moved to a new town to start fresh. But it seems they can't escape bullying and ridicule; Lyn, with her hunchback, short leg, and eccentricities, is taunted by adults and children alike wherever she goes. Iona, desperate to fit in at her new school, becomes the unknowing scapegoat for the popular girls, who treat her like abused pet. Iona and Lyn's close relationship begins to uravel as Iona tries to distance herself from her mother, and retreats to a fantasy world. Lyn's life revolves around Iona, and so Iona has become, in many ways, a copy of her: they love animals, big cups of tea, and sharing a bed to comfort each other in their loneliness. But this all changes when Iona gets involved with the 'mean girls'; too naive to see that they are using her for their sadistic pleasure, and desperately wanting to find love outside the home, Iona changes from a sweet and loving girl to one who is despondant and almost cruel. In turn, Lyn also suffers from being bullied by her peers, in her desperation to find a friend when no one can see past her physical disabilites, and quiet and kindly demeanor. Haywood does not hold back on showing how gut-wrenching and painful it is to be bullied, and has little sympathy for those who perputrate the crime; it is entirely deliberate that the mean girl who soon realizes the horror of what she is witnessing (and at least for a while, a part of) is Chelsea, the lone Black girl in the group who knows that she could just as easily become a target. While Lyn's home is decorated in bright colours, Haywood is sure to show the chipping paint underneath, as Lyn and Iona trying to (literally and metaphorically) hide the pain that abuse has inflicted on them. In turn, Iona's daydreams are soft and lyrical (even if the content is a bit harsher), contrasting against the reality of her downward spiral. But it is Scanlan's powerhouse performance as Lyn that centres the film. Layers of happiness can easily slip away when something she loves is taken away; as much as she tries to be both friend and mother to Iona, her own painful (and implied abused) past comes back to haunt her when she takes her own pain and anger out on her daughter in a moment of weakness. When the final straw hits and she decides to make a terrible sacrifice, the pride felt by the audience, followed quickly by terror and pain, is almost too much to bear. Indeed, this is a film in which you want to jump into the screen, punch a few bullies squarely in the face, and then grab Iona and Lyn and run for safety. It is a tribute both to Haywood and her actors that you feel the emotions of this film so entirely and without restraint. It is an amazing feature debut, one that will resonate with anyone who has ever suffered this kind of abuse, and hopefully with those who have perpetrated it.